The HTRUS 500-lb. 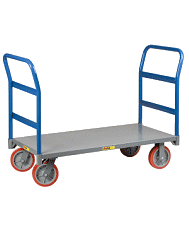 capacity hydraulic table cart enables user to lift or lower heavy cargo easily for loading or unloading, using foot pedals. 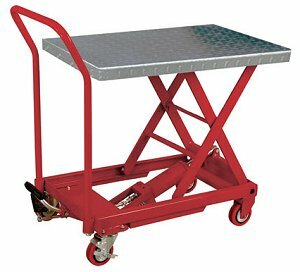 Features durable diamondplate steel table and smooth-rolling casters. Limited use, but well worthed. This table cart could help most people with lots of chores in the garage or outside work. I'll be using it primarely for unloading heavy stuff from my SUV like cases of water and many products that I would purchase. It works very well, even though its quite nosy and rattles alot maybe better rubbery weels would have helped but I have no complaint.